After all, there was no quieter place in the world than Norway. Nothing ever happened there. I felt warm. Once upon a time my grandmother was supermodel caliber. The pictures on her wall made that more than clear. I didn’t really know what to say. But I rarely did when I was talking to boys other than Graham and Tuck—and they hardly counted. The old lady reached me, so I turned and smiled, struggling to remember how to say sixteen in Norwegian, since holding up ﬁngers for my age hadn’t cut it for a while. 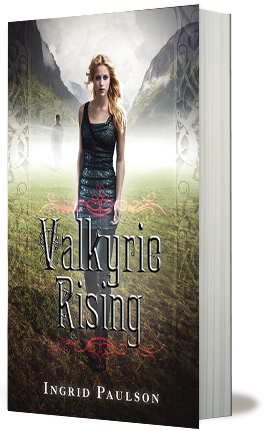 While overall decent and readable, Valkyrie Rising certainly failed to impress me. The plot was full of holes and randomness. I found most of the developments to be either totally predictable or, at the very best, simply improbable. There were certain moments when things conveniently happened even though they shouldn't. And while I didn't find the writing especially bad, or the characters especially annoying, I can't say that I enjoyed this book a lot. The lack of tension, shallow worldbuilding and mythological and cultural backdrop that wasn't explored nearly enough - all that left me feeling unsatisfied and disappointed. I've read my share of mythology/folklore based books and I find that they're either hit or miss with me. And this one was definitely a miss. When I pick up a book that not only draws from mythology, but is also set in a foreign (i.e. exotic to me) country, I expect it to have a rich cultural tapestry, unique atmosphere, or - at the very least - a well-researched, interesting background (including myths and folk stories, religious beliefs, traditions and/or local superstitions). And while I can't say that I'm an expert on Norse mythology - or Norway in general - I also can't say that I felt even a tiny bit more knowledgeable after reading Valkyrie Rising. In my opinion, the biggest fault of this book is that non of the plot threads were explored to the fullest. The mythology and culture was there, but it was scarce and flavorless (honestly, all that stuck with me is that Valkyries are beautiful, powerful and can make people fall in love with them). The action part of the story was unevenly paced and not as thrilling as I hoped it would be. The evil villains were quite stereotypical, too. Ellie's love life seemed to be the primary focus of the plot, but it, too, seemed cliched and forced to me. Tucker was somewhat cute, but I can't say that I was especially interested in him. He was charming, handsome, funny and protective of Ellie, but didn't have any unique characteristics that would make him stand out of the "YA love interests" crowd. The thing that annoyed me the most, though, was Ellie's incredibly low self-esteem and her constant "I'm not pretty/interesting enough" act, when it was obvious from the very first page of the book that she looked like one of Victoria Secret's models and wasn't lacking in the brains department either. The whole set-up was just so cliched! The gorgeously hot, older guy and the wallflower girl who is blissfully oblivious that she's hotter than Sun! Oh, come on! Don't get me wrong, I'm not saying that this book was horrible or a total waste of time. There were certain aspects of it that I really enjoyed. I liked the small and creepy village of Skaveopoll where most of the action took place. It was a picturesque setting with a lot of history and I liked the way Ingrid Paulson depicted it. I especially enjoyed the scary vibe the town folk gave off, being all secretive, protective and unwelcoming. I also enjoyed reading about Ellie's grandma, though I must admit I don't understand why she had to put on the "I don't see no pink elephant in the room" act. She knew all the secrets and was aware of the evil lurking behind every corner, and I just can't comprehend why she chose to keep all that from Ellie, putting her life in danger. Overall, I thought this book was OK. While it didn't exactly blow me away and I had some problems with the way the story progressed, I also thought the premise was unique and intriguing. If only it was explored more in depth! I would have loved to learn more about Norway, its culture, history and mythology. I probably won't be picking up the next book in the series, but don't let my review discourage you from giving this novel a shot! Who knows? You might end up loving it! I'm not sure this is really something I get into. I like that village had lots of creepiness though. I might just steer clear of this one. Thanks for sharing your thought on it. I was really hoping to love this one but just like you I wasn't blown away either. I didn't hate it but didn't love it either. Too bad this one didn't do it for you. It seems like a bit of a waste to set it in Norway, then not have any cultural flavour. I always hate reading your reviews because I feel like your reviews are so strong that I gotta go and get it now. I found one that I didn't feel like I had to run and get. LOL! @Kelly, wow, this is the first time someone told me they hate my reviews hahaha! Guess there's a first for everything, eh? :) But I'm glad they make you run out to buy books *evil laugh* Save your money this time, chick! @Bianca, this is more or less how I feel. I didn't hate it, it had its good moments, but overall it just didn't do it for me. And it's a shame, cause the premise seemed so fascinating and full of potential! I have wanted to read this for a long time, but I am afraid that it will not be good and it will infuriate me.